This little corner in our living room makes me happy. There is no other way to put it. It flat out makes me happy. I think it represents me better than any area of our home. I made up my mind when I started this living room spruce up that I wouldn't let anyone influence my color choices and only decorate with things I love. 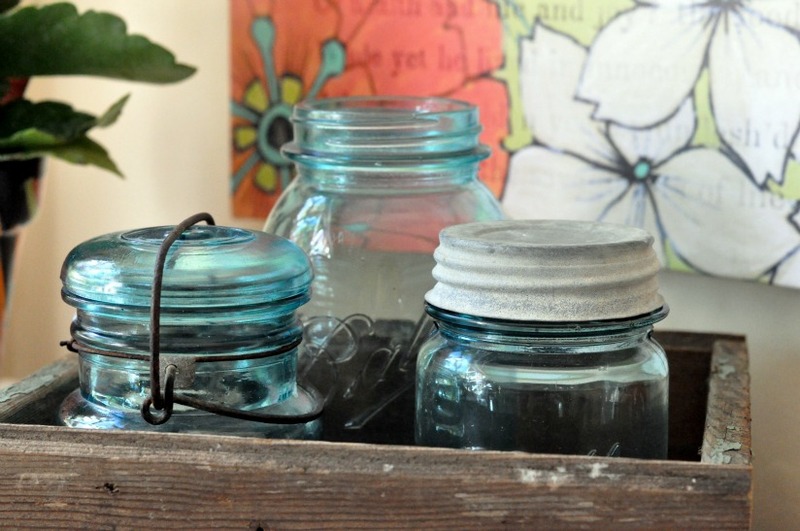 If I want to put aqua blue ball jars in a chippy old box and place them next to a vibrant cobalt blue and bright orange potted plant then I will...because it makes me happy. If painting an old upright lamp sunshine yellow and placing a new turquoise geometric shade on it floats my boat then so be it. 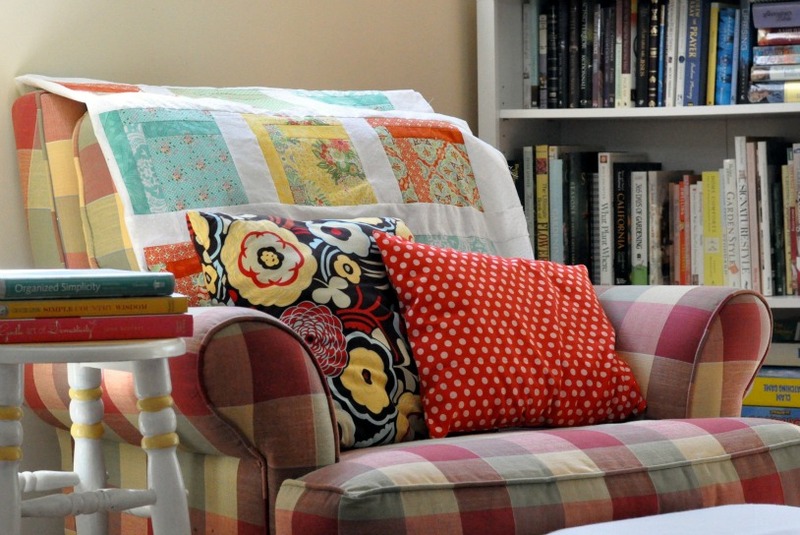 If I want to turn the challenge of a gifted (read hand me down) plaid chair into the most comfortable reading corner around by throwing a colorful quilt over it, then I did it. If I feel inspired to throw in some mismatched handmade pillows just to infuse even more color and comfort that's fine, too. You see this is my little reading corner in my little house. It isn't my moms or my sisters or my friends or that stylish bloggers...it's mine. It's where I go to retreat from the world, it's where I go to relax and unwind, it's where I go to read to my grandchildren, it's where I go to ponder things great and small. I'm calling it Bohemian Cottage and I find it creeping into the rest of the living room as well. It's happy and cozy and hard to mess up. It offers grace when there are toys and blankets strewn about and the books are stacked high. It allows room for an impulse buy at the flea market knowing I can make it work in here somewhere. What about you? 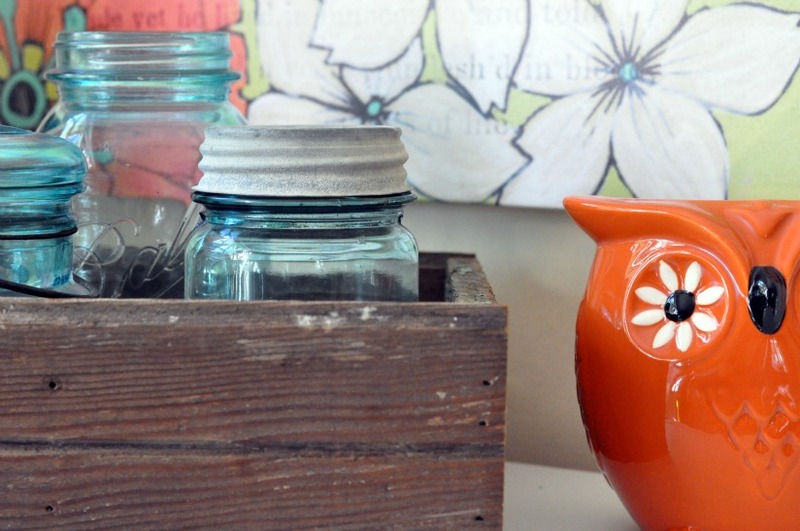 What decorating style makes you happy? I know we need to take our families into consideration when we decorate but do you have a spot in your home that is decorated just for you? 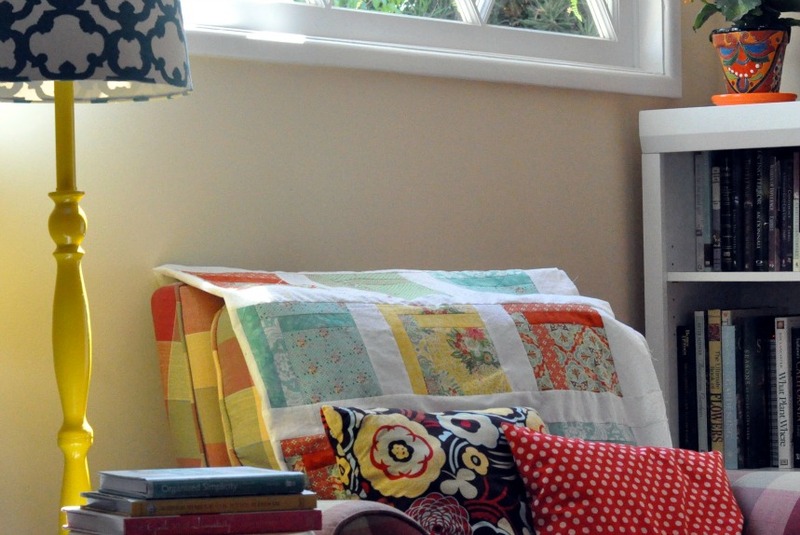 I am sitting on my bright colorful sofa with my Lavender Dreams quilt behind my back, writing to you on a netbook. It's wonderful to have things the way we want them...that makes us happy! I love your sweet chair and all of your pretty things! Way to go! I can totally see why you love it! The vibrant colors with the coziness of a comfortable chair and quilt make me want to grab a book and curl up for an afternoon of "me" time. Thanks for sharing your happy little corner. It is perfect! Love it. We moved a chair across the room in my living room and suddenly it gets used all the time as a reading chair. I love a good reading space. Nice job!! Love the bright colors. I've got a lot of dark colors in my apartment and I'm getting ready to lighten things. Thanks for the inspiration. It is a happy place, Patty. As it should be...our homes should be full of the things we love. I look at some of these fancy blogs and wonder HOW they really live in that stuff! Hi Patty! I love your sweet corner and love your use of color too! The aqua and oranges look so pretty together. Looks like a very comfy cozy chair! I agree with Betty. I love beautiful things, but I need to live surrounded by simplicity, comforting colors and things that make me feel like "myself." And I find that new things are missing something. "Make do" things are more creative and personal. I'm with you. I adore your Happy Place in your living room!!! I'm updating my creative space in Studio One for just the exact same reason. . .
it's MY place to go to ponder, relax, create, plan..."chill". Stay true to your style...experience true happiness!!! getting back to my Traditional Roots!!! and tranquility have flodded over my soul!!! It is a warm and cozy spot Patty. I love the way you have it decorated too. The colors all work together, and they are so happy! My style? Hmmmmm, Early American Antique and Thrift!!! How I love your comfy little corner. I could spend hours snuggled up with a warm quilt, my kitties and a sweet cuppa hot tea. Looks like a great place to be!! I love your interpretation of bohemian cottage! It's so cozy and cheerful! I love your little corner! The colors and style are happy, bright, and cheerful. Oh, my eclectic sister! I love it. I love your corner..so comfy and inviting. I also love color and for some reason as I have become older I am in love with the color red. There was a time I would never have used that in my color schemes. It makes me happy for some reason. I totally agree your home should be what you love...after all your the one spending the most time there and it is your retreat from the outside world. Great post! Bright, Cheery & Happy! Love! I love it, Patty! I think it is the 'you' that I know.....bright, inviting and welcoming. I have always decorated to suit myself...period. Our cottage has many different styles. I never want to go into a room and have it look just like the one I came out of! This is a special corner for you...and it's adorable. OOO, and I'm your new follower...come see me when you have time. You have the perfect little spot!!!! Absolutely perfect!!! I think your favorite corner reading spot is just perfect and all the colors work wonderful together. 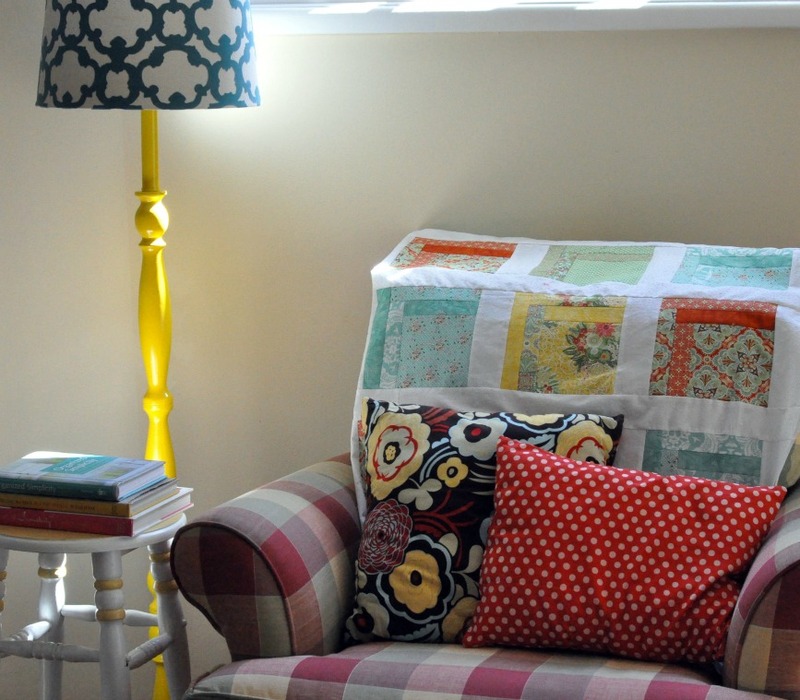 The quilt on the back of the chair is lovely:) Thanks for sharing at the Cabin! The last two posts say so much about you, Patty. They are you. I love your style and would feel so at home sitting in your living room and sharing stories and a cup of coffee with you. 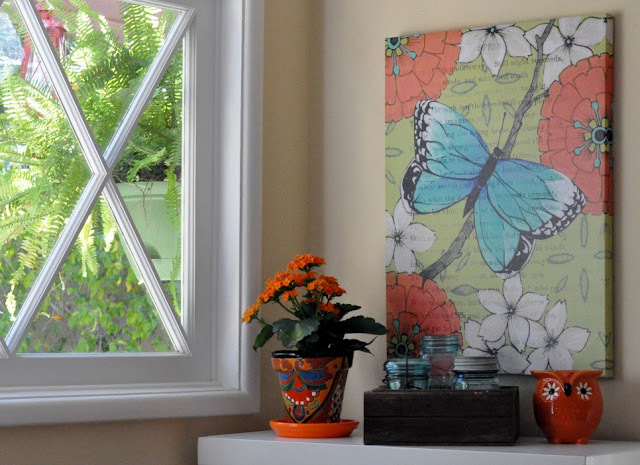 You have some great pieces that add color and comfort and some that add the interest, but they all say Patty lives here with her family. Thanks for sharing you little corner of the world. I think Mary Engelbreit could sit down with her artists pencils and draw your little corner for one of her charming illustrations. Love it! Nothing wrong with happy and cozy! Love the mix of pretty colours and I agree with Vickie, Mary Engelbreit would be right at home. Such a lovely little reading spot. I especially like the quilt on the back of the chair, the aqua jars in the old crate and the bookshelf with your favourites at hand. Your corner is absolutely inspiring. 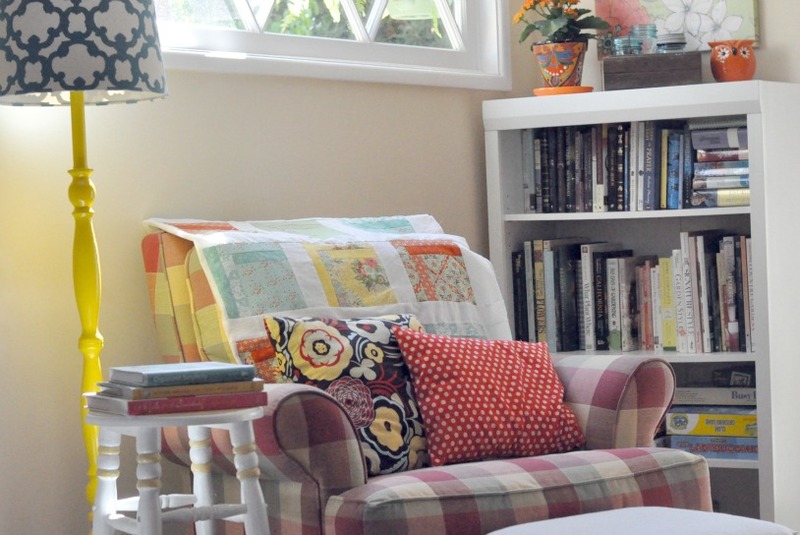 Love the plaid chair with all your homey gorgeous colors around you. I'd love to see what rest of that room looks like. You hit nail on head by putting all your "happy" stuff around you. I pretty much decorate to please me but if hubs doesn't like it he'll give me an off hand comment to let me know it's not flipping his skirt, lol. I try things I see on internet to see if I'll like/love it, if not then it goes away, I'll reuse it another time. Hubs helps by making things I see on blogs. We both keep busy almost constantly making things for our home. Making good use of thrift shop finds, our stashes, what ever it takes. Keep our old brains working and old bodies moving. New to your blog, subscribing. We have the same chair and ottoman! I just love it because it has so many colors to work with! I really love the space you have created. I'm visiting from Creative Cain Cabin! LOVE THIS! Such a beautiful gift to yourself!